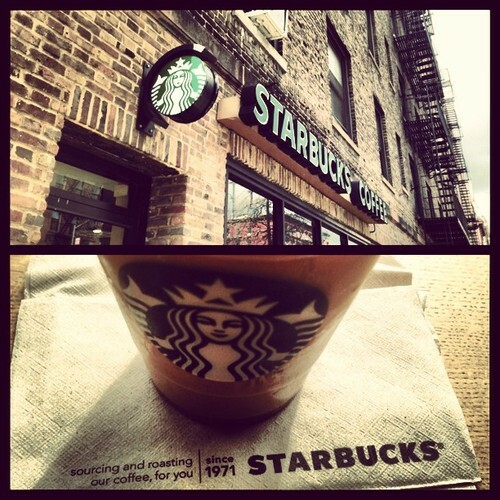 This Chelsea Starbucks on 19th and 8th is great for a hit and run. Which works out because I’m having one of those NYC Days where I have 25 obligations crammed into 24 hours. It’s in Chelsea. It’s an L-Shaped layout directly on the corner. It plays seductive elevator music. It’s in Chelsea. It’s smaller than most. It has a long raised table lining one side and a slightly elevated seating area in the base of the L. It’s in Chelsea. The barista’s a super friendly and chatty with both each other and the patrons. It has great lighting. It’s crowded but not overcrowded. Did I mention it’s in Chelsea? Well — that’s it for now folks! Gotta run (it’s a New York thing)! If you had to choose between a Starbucks that offered WiFi or a Starbucks that offered a restroom, which would you choose? What if you didn’t have a choice, and the Starbucks you were in had neither? That was my predicament at the Starbucks on 43rd and 6th. I wanted to stay — I really did — but there wasn’t anything to keep me there. I will say that in this Starbucks’ defense, it appeared the WiFi issues were only temporary, but neither my phone nor my laptop could gain access. Internet and technology fail all of us from time to time, but usually that’s when I pack up my things and head to Starbucks as Plan B.
I’m definitely noticing a pattern with the Midtown locations. They are the necessity Starbucks. They have your coffee, your tea, your breakfast sandwich or lunch pack, but when it comes to comfort or commodity — they come up lacking. Of course you can’t blame Starbucks. If only opened the nice comfortable locations, then they would be swarmed with patrons. Midtown is brimming with businesses, so the necessity Starbucks are just the supply to the neighborhood’s demand. Somewhere around 19th Street and Park Avenue South you have the collision of three distinct New York neighborhoods: The Flat Iron District, Union Square, and Gramercy. And I’m currently sitting at the Starbucks that sits there on the border. Since I’ve already visited the former two neighborhoods, let’s focus on the latter. Gramercy is a neighborhood structured around Gramercy Park. This park is unique for NYC in the fact that it is a private park, and only residents with a key can obtain access. No worries though, the park is actually quite small, and all a member of the general public need do is walk a few blocks west or south to the nearest public park. Trust me, Manhattan is not having a park shortage. But this disposition toward solitude may reveal why Gramercy, the neighborhood, has gained the reputation of being very quiet and reserved. One peculiar fact about the Starbucks on 19th and Park is that it has one entrance that leads into the street and another that leads into a Bank of America. 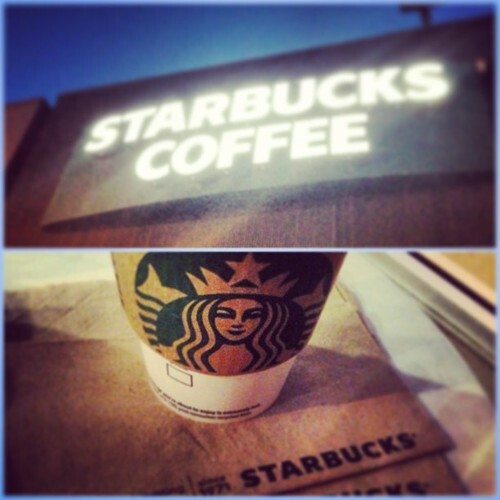 In case you were wondering the natural progression of the average caffeine addict, it goes bank –> Starbucks. And this location just expedited the process. There’s also a Chase directly across the street in case you’re not down with BofA. Although not the most impressive of Starbucks, this one is not without its charms. The two red armchairs and poster sized image of an Italian scooter are two notable characteristics. Happy Saint Patrick’s Day to all my coffee lovers out there. And a shout out to all you hard working baristas who just happen to rock the color green each and every day. Although I have a strong Irish last name — McCourt — my identification with the culture stops at potato pancakes and the occasional Guinness. Regardless, today in NYC everybody is a little Irish. 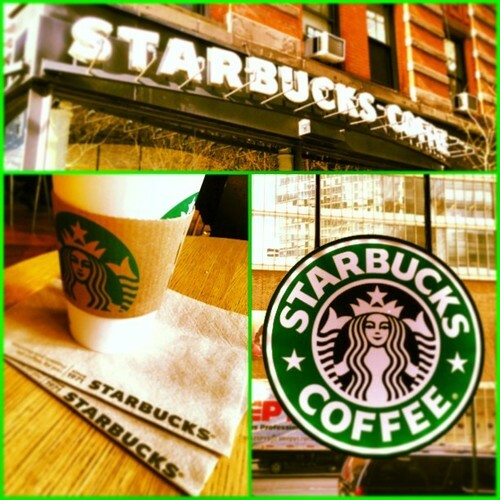 The Starbucks I’m currently sitting at on 67th & Columbus Avenue is greener than Kermit the Frog with a stomach flu. Just a few blocks north of Columbus Circle and Lincoln Center, this location is immediately impressive because of it’s large size. In fact, everything at this location is bigger. From the barista bar to the seating area, everything seems to have been stretched. Even the hallway to the bathroom is much longer than most. There are two entrances (one on the street/one on the avenue) and tons of seating for anyone to enjoy. Unfortunately, this Upper West Side Starbucks is clearly the target of many, because those seats are all filled up. In fact, I can see at least three separate individuals prowling for an open spot at this very moment. Luckily, no matter how crowded a location may be, I have a tendency to find an open seat within minutes. Maybe it’s the city of New York opening the door for this blog to continue — and so it does. 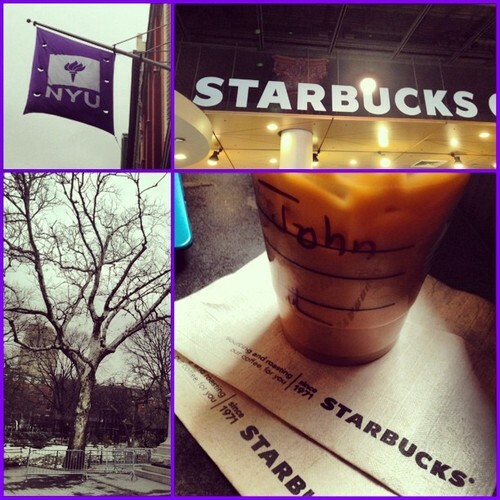 They say in New York there is a Starbucks on every corner. While technically this statement is an exaggeration, it is areas like 49th street and 8th avenue that make it somewhat believable. 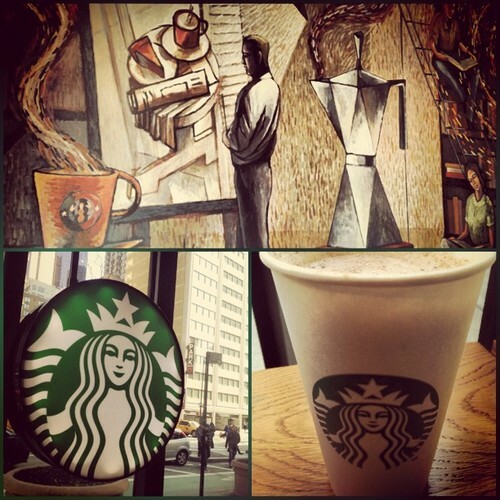 This Starbucks is adjoined to the Worldwide Plaza building on the corner of 49th street and 8th avenue. But it’s not alone. 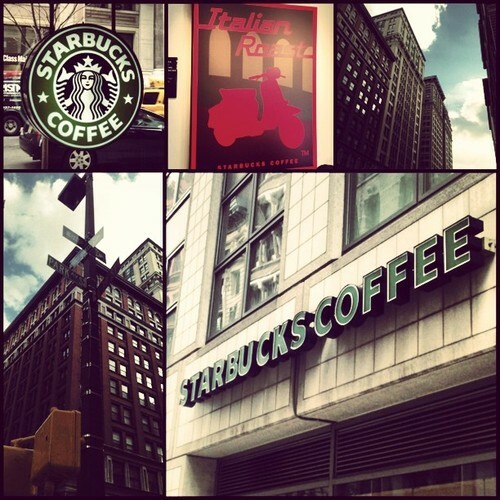 If you continue to walk east on 49th street you run into yet another Starbucks attached to the same building. Two Starbucks in one building — impossible? Not in New York. 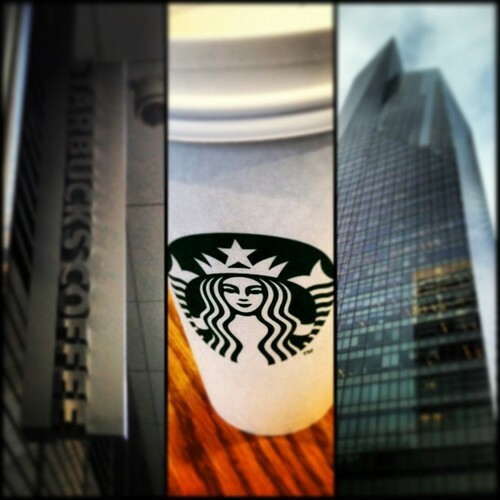 Needless to say the office workers in One Worldwide Plaza must be as addicted to Starbucks as I am. Both locations have their perks, but this blog is dedicated to the corner location. This Starbucks attracts a strong crowd. It has a street entrance and a back entrance that leads further into the plaza. Although I stop here occasionally while on the run, I’ve never taken the time to sit here — mostly because doing so always seemed impossible. Don’t misunderstand. There is a decent amount of seating — it’s just always full. Today — however — I landed a seat with minimal effort. Below are my findings. 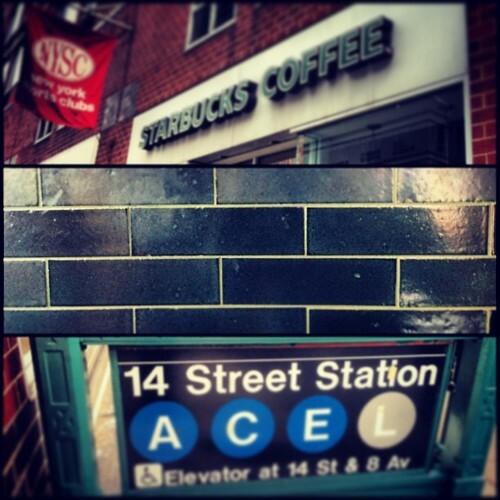 The Starbucks on 31st and 6th is actually the first location I ever visited in New York City. The image on the banner of this blog was taken here in December of 2011 when I first visited the city. We arrived very late on a Wednesday, and the following morning I woke up well before my friends. Getting a glimpse of the city from our hotel room on the 14th floor of the Hotel Pennsylvania made exploring NYC irresistible. So I descended into the city solo, while my friends slumbered. 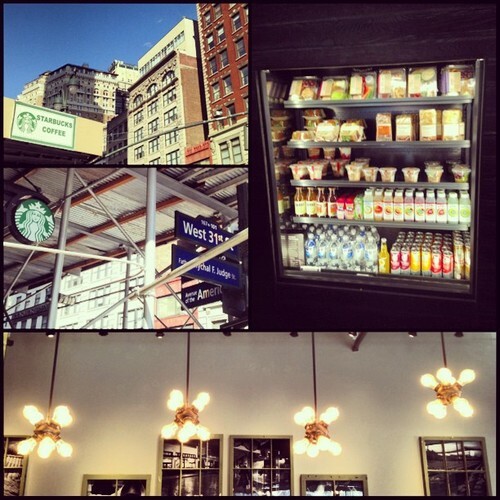 I walked aimlessly around crowded Midtown in the peak hours of business foot-traffic until I spotted this Starbucks. I think at that moment I knew that the rest of my visit would be spent finding a way to make this city my future home — and that’s exactly what I did. Unfortunately, this Starbucks has not remained as I left it. The exterior is now burdened with one of those construction awnings. If that would have been the case in December of 2011, I may have missed this location entirely. But don’t let the lousy exterior full you — the interior of this location is beautifully decorated. It also has a decent amount of seating to help tackle the crowds that poor in. It is larger than most Midtown locations, and the design pushes the line toward the back to help eliminate congestion. 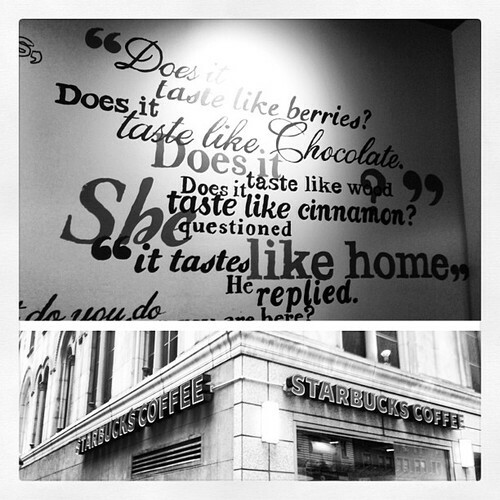 I definitely don’t remember the first Starbucks I ever stepped foot in, but this location is unforgettable. After giving us three beautiful days in a row, it seems the weather gods of NYC decided to curse us with a miserable rainy day. Most people stay in on days like these — I put on my rain boots and head to Starbucks. You’re practically guaranteed a seat at any location since so few are willing to venture out into the rain. Not wanting to venture too far — there’s only so much rain one can take — I settled on a Starbucks in Midtown. This Starbucks on 55th and 7th may be on the same block as the 54th and Broadway location, but their resemblance stops at the drinks they serve. This location is large and inviting. Its neighbor could not even squeeze in a restroom. “Does it taste like berries? Does it taste like chocolate? Does it taste like wood? Does it taste like cinnamon?” She questioned. “It tastes like home.” He replied. We all have scents, sounds, and tastes that bring back memories. I taste home whenever I have plain hot coffee with cream and sugar. I started drinking coffee at a very young age. It was my Grandmother that first introduced showed me the light. I remember how she would leave one cup in the carafe for me. She’d do it despite my mother’s insistence that I was too young for coffee and that it would stunt my growth. Luckily, I survived to be a well-rounded 5’10. It is another beautiful day out in New York City. So I decided to pay a visit to the neighborhood that has become my favorite area to go shopping, have lunch, or just simply walk around. You guessed it — welcome back to Chelsea. The Starbucks on 16th Street and 8th Avenue was designed with NASCAR fans in mind. It functions like a racetrack, and is the perfect pit stop on your way to and fro. You walk in and steer to the left wear you order at the barista bar. Progress forward and pick up your drink at the end of the row. Need to use the restroom? Merge right. If not, then make a U-turn and face the creamer station. From there your back where you started and a few steps from the door. The good thing about Starbucks such as these is that they are perfect for grabbing a quick cup on the go. The downside is that they don’t make the best sitting locations. Yes — there are stools lining walls here, but they’re condensed and highly populated. Since this one is directly on top of a subway terminal, it is clear who Starbucks was catering to when they opened this location.